MLS#: 4008800 - Courtesy of Good Mountain Real Estate, Inc. Please have offers in by 3 pm Monday, March 18th. Everything you've been looking for in Evergreen Meadows West. This stunning home with breathtaking views offers you the mountain lifestyle of your dreams. Come home to your paved, south-facing driveway & park in your heated 2 car garage. 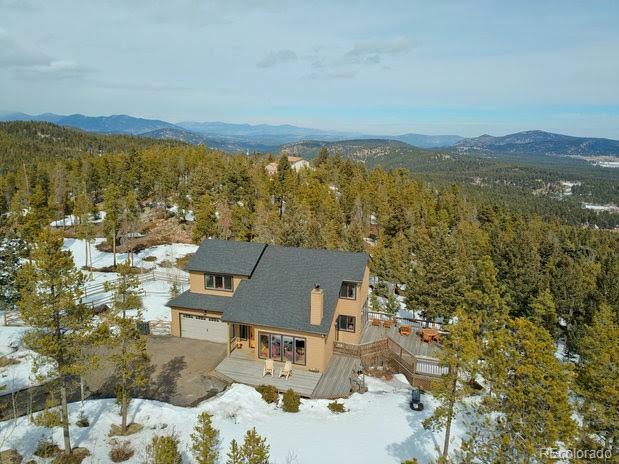 Feel the energy that surrounds you outside, while you enjoy the mountain contemporary upgrades including: stainless appliances, rustic log accents, granite counter tops, new plush carpet, & new roof. Your guests will love the walkout basement which features a bedroom, full bathroom, heated floor and living room with gas fireplace. This 2 acre property backs to Flying J Ranch Open Spaceâjust walk out the back door & hike for miles! Venture out to your deck to enjoy a BBQ with friends or evening of stargazing from your hot tub. Property features a fenced yard for pets & room to park your RV. Located on a quiet, welcoming neighborhood. Only 10 minutes to Hwy 285 & easy access to Evergreen.